Casual Day was not merely a “casual” day at the local Magistrate’s Office, but a simply wonderful day that made a difference in the lives of the disabled people from Khanya Group. 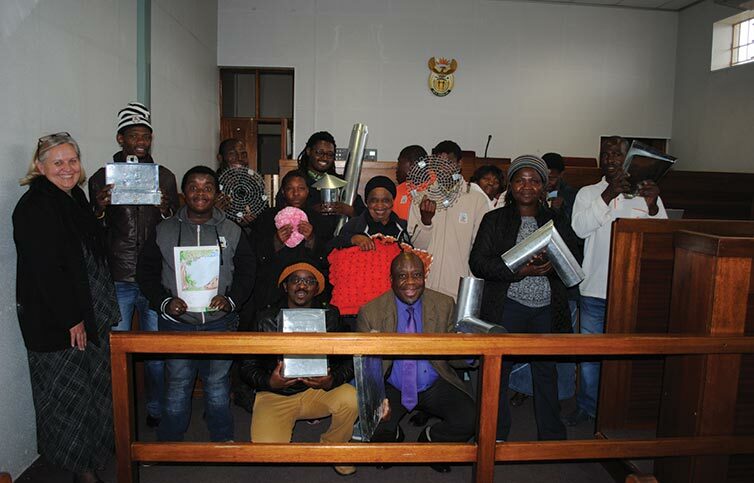 The group from the Khanya Centre in Ethandakukhanya were invited to visit the Magistrate’s Office on Friday, 4 September – Casual Day. Thabo Mthetwa, cofounder of the NPO group called Christ for Mama Africa arranged this visit with Ms Valli (court manager) and proposed that they conduct the visit during the lunch hour when the courts were not in session. Since the Magistrate’s Office excels in terms of customer service, it was thought fit to bring the disabled to get the best service in town. The group was represented by 15 individuals who wanted to showcase some of their talents and sell some of their craftwork. These inspiring people, with Gogo Zodwa Mthembu in the lead, were accompanied by Thabo, who also acted as interpreter during the visit. Nonhlanhla Sibeko represented and spoke on behalf of the DPSA (Disabled People of South Africa). Staff at the Magistrate’s Office received the group in Ms Kusche’s court room. Members of the group had a chance to introduce themselves to everyone present and proudly showed some of the very handy and lovely articles that they make and sell. Sink post boxes, petty cash money boxes, dust scoops, baking tins, scatter cushions and covers, beautifully crocheted doilies and lovely drawings to name but a few. The group members explained what kind of disability each of them suffered from, how it came to be that they were part of the Khanya group and sang lovely songs.